This type cable is usually yellow in color and used in what is called thicknets, and has two conductors. This coax can be used in 500-meter lengths. The cable itself is made up of a solid center wire with a braided metal shield and plastic sheathing protecting the rest of the wire. As with the thick coaxial cable is used in thicknets the thin version is used in thinnets. This type cable is also used called or referred to as RG-58. The cable is really just a cheaper version of the thick cable. Is more common in high-speed networks. 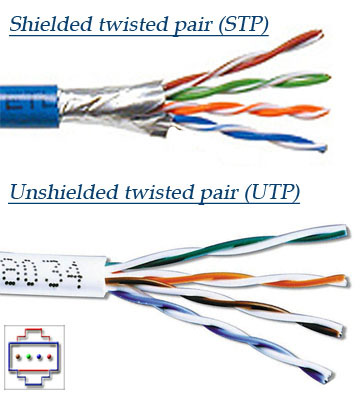 The biggest difference you will see in the UTP and STP is that the STP use's metallic shield wrapping to protect the wire from interference. Now to familiarize you with more on the Ethernet and it's cabling we need to look at the 10's. 10Base2, is considered the thin Ethernet, thinnet, and thinwire which uses light coaxial cable to create a 10 Mbps network. The cable segments in this network can't be over 185 meters in length. These cables connect with the BNC connector. Also as a note these unused connection must have a terminator, which will be a 50-ohm terminator. 10BaseF, this little guy has the advantage of fiber optics and the F stands for just that. This arrangement is a little more complicated and uses special connectors and NIC's along with hubs to create its network. Pretty darn neat and not to cheap on the wallet.